“Confound It” by Maggie Toussaint is a new addition to her ‘Dreamwalker’ series. However, even though I was not familiar with any of the author’s previous works, I had no problem keeping up with the characters and storyline. In this charming novel, we are introduced to a variety of characters, new names as well as some faces familiar to fans of the series, including: Mandy Patterson, a meth cook trying to stay below the radar in Sinclair County, Georgia, her son, 16-year-old Doodle, and the mysterious palm reader, Cipriona Marsden. Just as Baxley Powell is beginning to gain confidence in her abilities as a second-generation dream walker, everything is turned upside down when she is asked by the Sherriff to help sort through Mandy’s sudden, unexplained, death. She also has to consider her feelings for her friend, fellow dream walker, Sam Mayes, who has just arrived in town for a visit. In Mandy’s last moments, shown to Baxley during a dream walk, she asks Baxley to “tell them” (31), making her unexplained death look more like premeditated murder. When Mandy dies, Doodle only family member left is his mother’s unpleasant sister June, who is obviously only interested in what the boy can do for her. Baxley has a soft spot for the boy and his criminal mother, even though she can tell that Doodle is hiding something. What could he be hiding? With a myriad of possible suspects, I was never sure of the “who done it” until it was revealed. The story was not so complex as to be confusing, but it didn’t leave me feeling bored either. The connection between the spirit world and the “real” world that Baxley and Mayes experience is described with such intense detail that I found very easy to picture in my mind’s eye. The characters were colorful, i.e. Ricky and Tip Dixon, and diverse. I found myself rooting for Baxley to let go and allow herself to be happy. If I could, I would change the way Doodle interacted with other characters. As the mother two sons, I found his verbiage to be inaccurate based on my experience with a house constantly full of teen boys. 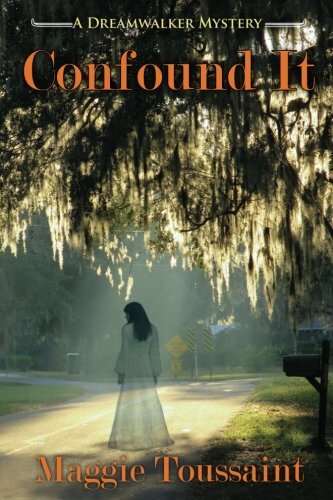 I found “Confound It” as a whole to be an easy to read, thought provoking, but not overly complicated novel that will please Maggie Toussaint’s current fans, and is certain to gain her even more!